Bioprinting droplets can generate fundamental 3D tissue models. 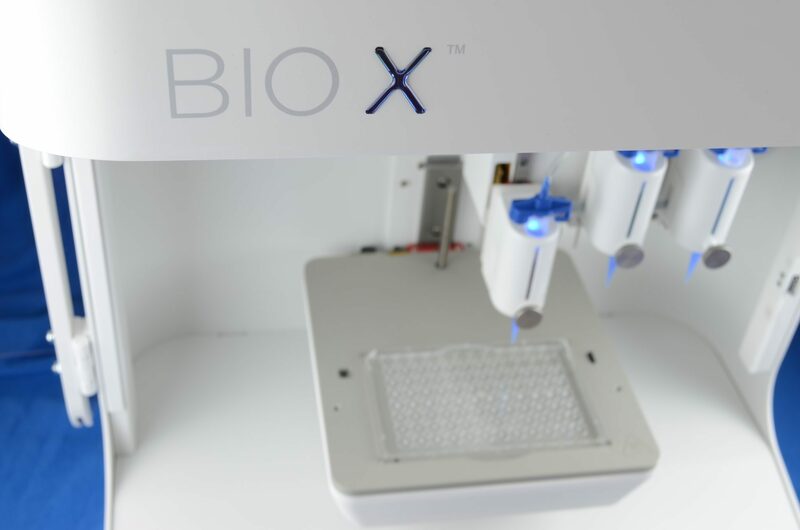 We want to inspire you to quickly print reproducible 3D models using the BIO Xs Droplet function. In the following section, we demonstrate printing droplets using the build-in Droplet function, a perfect way to start your first 3D cultures. In this video, we demonstrate printing droplets using the first printhead with attached 22G nozzle. CELLINK bioink was mixed with cell suspension in a 1:10 ratio. Single droplets were extruded under pressure of 10-15 kPa for 0.75 seconds onto the surface of a 96-well plate. The droplets were printed on the lid for better visualisation. The Droplet function allows you to rapidly create a large number of samples to ensure high reproducibility of your research. To ensure their stability and longevity of the printed constructs, CELLINK Bioink droplets can be crosslinked by adding our crosslinking agent. After one medium wash, your cell laden droplets are ready to be cultured in standard cultivation environment. Any CELLINK Bioink can be easily printed with the Droplet function. However, the performance of extruding filaments may depend on the properties of the bioink or the conditions of the bioprinting process. CELLINK Bioink allows you to print a continuous filament through a range of different nozzle diameters. 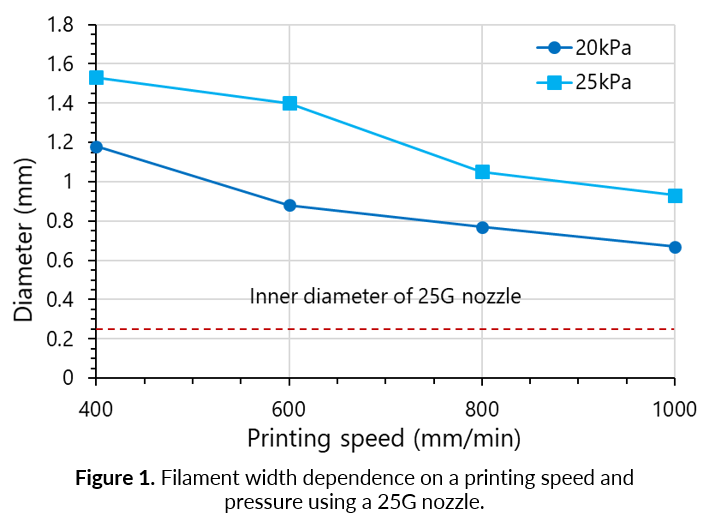 To minimize the difference between the width of the extruded filament and the inner diameter of the nozzle, print CELLINK Bioink at low pressures and high printing speeds (Figure 1). We recommend using 25G or larger diameter nozzles to prevent the nozzle from clogging due to the fibrillar morphology of nanocellulose. CELLINK Bioink consists of well-dispersed cellulose nanofibrils which form a stable network. 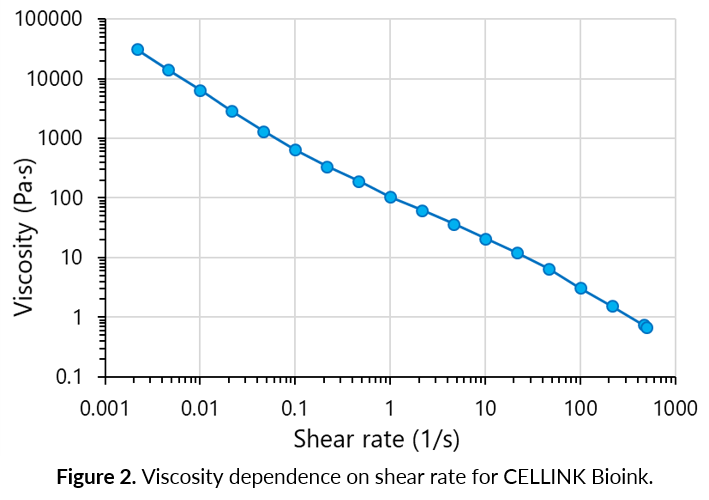 As the bioink’s viscosity decreases with the increased shear rate and vice versa, CELLINK Bioink exhibits a shear thinning behaviour perfect for 3D bioprinting (Figure 2). The resulting filament is smoothly extruded and it maintains its shape after printing. The performance of CELLINK Bioink is not affected by the temperature of the environment, which allows comfortable printing at room temperature. With this droplet function, many reproducible droplets with single or multiple cell types can be used to generate medium-throughput 3D tissue models. The dimension of the droplets can be controlled with either changing the nozzle size, the pressure, or the extrusion time. By utilizing human cells encapsulated within a 3D environment, bioprinted tissue models can mimic the native phenotype of any cell type as compared to conventional 2D cell models. This fundamental and feasible 3D tissue model can be used for drug discovery via high throughput drug screening, understanding cell biology such as cellular communication and maturation in biomaterials, and improving primary cell survival that require controlled aggregate/suspension culture.